India's exports are projected to grow by about 22 per cent to $216 billion in the current fiscal on the back of recovery in global trade, the Prime Minister's Economic Advisory Council said today. The high base price of wheat announced by the Food Corporation of India is responsible for the corporation’s failure to elicit any response from flour millers for sale of wheat under its open market sale scheme (OMSS). IT major Wipro today reported a growth of 30.5 per cent in its net profit at Rs 1,318.6 crore for the first quarter ending June 30, over the corresponding quarter last year. The company had a net profit of Rs 1,010.4 crore during the April-June quarter a year ago. Biotech major Biocon today reported a consolidated net profit for the first quarter ended June 30, 2010 at Rs 76.74 crore, up 33.34 per cent from the the same period previous fiscal. Telecom regulator TRAI is hoping to complete a study on recommended caps on mobile bandwidth and a proposed one-time charge in the next two-three weeks. The TRAI is also considering regulations for value-added services and software services for mobile phones, its chairman J.S. Sarma told reporters here today on the sidelines of a conference. The government today approved 18 foreign investment proposals worth Rs 2,245.32 crore, with the major inflow being accounted for by Transcend Infrastructure for setting up communication and broadcasting towers business. Transcend Infrastructure (TIL) proposal entails FDI inflow of Rs 1,932 crore, a Finance Ministry statement said. Amid market turbulence and volatility, India's largest lender State Bank of India has raised $1 billion (about Rs 4,700 crore) through bonds from the US market, paving way for others to tap the market. The PMEAC expects exports to overshoot the Commerce Ministry's target of $200 billion, which was set against $176.6 billion achieved in 2009-10. It projects merchandise exports to go further up to $254 billion in 2011-12. Without elaborating, however, the council said the country's exports face uncertainty. "The anecdotal evidence from export businesses on their order position and trade enquiries suggests that a stronger growth may be possible, but there is some uncertainty about this," it said. With contraction in global merchandise demand, India's exports declined by 4.7 per cent to $176.6 billion in 2009-10. However, in the first two months of the current fiscal exports grew by 35.7 per cent. Global trade has seen recovery in 2010 and the outlook looks bright. The International Monetary Fund has projected that exports, at constant price, from emerging and developing economies would increase by 10.5 per cent in 2010. 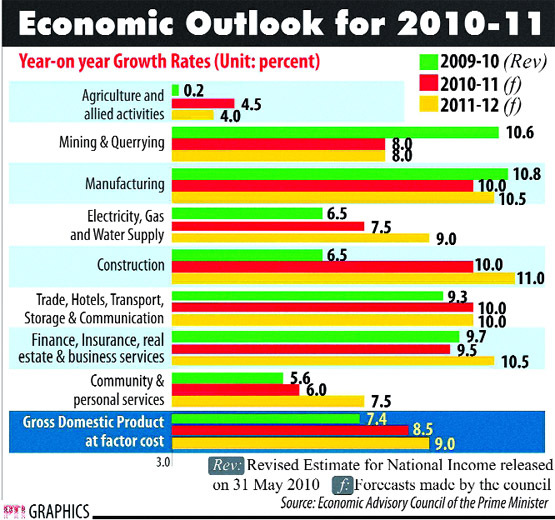 Exports from the advanced economies are also expected to rise by 8.2 per cent. The PMEAC today projected foreign investment in Indian capital markets to fall to $25 billion this fiscal from $32 billion in the previous year, even as it expected India to remain a lucrative destination for capital inflows. "During 2010-11, there will be portfolio capital inflows of $25 billion, down from $32 billion in the previous fiscal," the PMEAC chairman C. Rangarajan said while releasing the Economic Outlook 2010-11 report. However, portfolio investment in the next fiscal will again rise to $35 billion, the PMEAC said. This will lead to rise in FDI to $50 billion this fiscal from $31.7 billion in the previous fiscal. During the past two months, it has failed to get any response for sale of its wheat in Punjab, Haryana and Chandigarh. Officials in the corporation informed TNS that an auction for sale of wheat has been held twice, but no one has come forward to buy it. The corporation proposes to sell 1.04 lakh tonnes of wheat in Punjab, 27,000 tonnes in Haryana and 2,700 tonnes in Chandigarh. Private traders and flour mill owners say that the corporation has kept a base price at Rs 1,239.89 per quintal, and also charges VAT at the rate of four per cent over this price. Besides, the high transportation cost from the FCI godowns, which are located at a far distance from the flour mills, also jack up the price. “The wheat purchased from FCI costs Rs 1,300 per quintal, whereas we get the wheat from the open market in Uttar Pradesh at Rs 1,250 per quintal,” said a Ludhiana-based miller. Officials in the FCI, while agreeing that the base price was high, said the decision to reduce the price lay with the government. “But we can still float tenders for the auction twice before any further decision is taken,” said a senior official. However, private millers say that since the FCI has abundant wheat stocks and wants to sell it, it will have to bring its price at par with the market price. “So, most of the millers are waiting for the FCI to reduce its price and then they would come and buy their stocks. Most millers still have wheat stocks for two-three months and are not in a hurry to buy at high rates. Why would any trader buy wheat at Rs 50 per quintal more than the market rate?”said another miller from Jagraon. It may be mentioned that the FCI chairman, Siraj Hussain, during his recent visit to the city had said that the government could decide on reducing the base price in case there were no takers. “We are seeing strong demand environment. We added the highest number of billable employees ever, in this quarter,” Wipro chairman Azim Premji said here today. The company’s net income from sales rose by 15.85 per cent to Rs 7,236.4 crore for the first quarter of FY 2010-11, from Rs 6,246.2 crore in the same quarter previous fiscal. The company added 4,854 employees in the quarter taking the total headcount to 1.12 lakh. For the second quarter ending September 30, 2010, it expects revenues from IT services business to be in the range of $1,253 to $1,277 million. The attrition rate of Wipro too jumped to 15.8 per cent during the first quarter (April-June) of this fiscal (2010-11) from 9.8 per cent in the corresponding period a year ago (2009-10) and 12.1 per cent a quarter ago. “Overall demand for IT skills has gone up with a rebound in the economy and uptake in tech spending. The attrition has gone up also due to many employees leaving for higher studies or business schools,” Wipro executive director Suresh Senapaty said. Net sales of the company stood at Rs 662.28 crore for the quarter ended June 30, compared to Rs 495.93 crore in the same period corresponding fiscal, Biocon said in a statement. A significant jump in Sajjan Jindal-led JSW Energy's production during April-June, has helped the company, to clock more-than-double net profit during the period. The consolidated net profit rose to Rs 299 crore, up 219 per cent over the same period last year. The steel major, which currently has an operational capacity of 995 MW, witnessed a 218 per cent jump in its quarterly turnover to Rs 962.87 crore, compared to the same period last year. The Vijay Mallya-led Kingfisher Airlines has narrowed down its loss by Rs 50 crore to Rs 187 crore in the June quarter as against Rs 237 crore in the year-ago period. The airline also expressed confidence that it can hit markets with the proposed $100-million global depository receipts issue by the end of this quarter. Financial consultancy IFCI today reported a rise of 17.09 per cent in profit after tax at Rs 118 crore for the first quarter ended June 30, 2010. IFCI income from operations during the first quarter soared by 55.85 per cent to Rs 496.71 crore over Rs 318.72 crore in the year-ago period, the filing added. Public sector lender UCO Bank today reported a 45.49 per cent growth in net profit at Rs 260.21 crore for the first quarter ended June 30. The bank also reported an increase of 10.80 per cent in its total income during the first quarter at Rs 2,862.73 crore, as against Rs 2,583.68 crore in the year-ago period. State-run power equipment company BHEL today reported 42 per cent jump in its net profit for the quarter ended June 30, at Rs 667.7 crore from Rs 470.6 crore in the same period last fiscal. Net sales or income from operations of the company rose 15.8 per cent to Rs 6,479.7 crore from Rs 5,595.7 crore in the corresponding period, last fiscal, a company statement said. Allahabad Bank today posted a 14.6 per cent increase in net profit at Rs 347.1 crore for the first quarter ended June 30, 2010. In May, the TRAI had suggested the government to charge telecom operators a one-off fee for excess bandwidth they hold beyond 6.2 megahertz for the GSM operators and 5 Mhz bandwidth for the CDMA opertors, respectively, for 2G services. It said the fee should be linked to the value of third-generation bandwidth, which was auctioned in May. The government has also set up a panel to consider the concerns of telecom companies over the recommended caps on bandwidth for mobile phone services and a proposed one-time charge. Top telecom companies, including Bharti Airtel, Vodafone and Idea, strongly opposed the recommendations as they had already spent large sums in the 3G and broadband wireless spectrum auctions. Bids for 3G bandwidth were much higher than the companies initially paid for bandwidth to offer 2G services and the operators felt the fee would hurt their financials in a highly competitive market with falling phone call rates. If the DoT panel accepts the recommendations of TRAI, the government will be able to rake in another Rs 20,000 crore to Rs 30,000 crore as a result of the one-time fee that the operators would have to pay. However, there are also chances that the operators may challenge the decision in court, leading to delay in other services. The company plans to build, acquire and lease towers for the communications and broadcasting sectors, it added. Meanwhile, the government has rejected 10 proposals, including those of Mahindra & Mahindra Ltd, INX Media Pvt Ltd, Telcordia Technologies and Siemens Ltd. Besides, 21 other proposals have been deferred and involve companies like Wipro, Zee Entertainment Enterprises, Jagran Media Network, Essar Capital Holdings (India), UTStarcom India Telecom and Verizon Communications India. The other proposals cleared include that of Frigorifico Allana Ltd for setting up a JV, involving FDI of Rs 125 crore. The successful completion of the bond issue, which was oversubscribed 4.8 times, shows strong fundamentals of the lender in terms of its credit profile and as India's largest bank.